The Astronomical function of Mars’ movement through a zodiac sign is within about roughly 45 days, depending on its speed, and retrograde motion. Mercury has gained quite a reputation for the retrograde, but all the planets (except the Sun and Moon) appear to go retrograde from the Earth’s perspective. Mars represents Tuesdays in the week. Basic characteristics of Mars are: speed, focus, effort, and motivation. This makes sense from an energetic standpoint of the 7-day work week. Mondays & Fridays are likely to be the least productive, as on Fridays people are already salivating for the weekend festivities and one step out the door, while on Mondays the majority of people are gearing up to the “back to the grind” mindset and possibly still in weekend-mode. Most beautician services are closed on Mondays, and I happen to know a certain metaphysical store that is also closed on Mondays… Point being, Tuesdays tend to be the most productive day of the week fueled on go-juice with a side of catch-up. Mars in Vedic Astrology is activated in your chart at the 27th year, where it develops maturity and begins to exhibit its full strength. We usually begin to experience more independence around this age. This is right before the infamous “Saturn return” from age 28-30, which serves the purpose to create more structure and permanence in our lives, which can only be done when the untamed wildfire of Mars calms down to focus on accomplishing more with a slow burn. Mars is the action-planet. It shows how you act and move through life. Its function is to create initiation and movement. Without Mars energy, everything would be still and stagnant. Mars is the warrior, the soldier. It’s the fighting nature that exhibits physical and mental strength, and inner and outer determination. This can express itself by being impulsive, quick-tempered, and destructive, therefore it is also the expression of Anger. Anger can be used destructively, or constructively based upon how that energy is channeled. On the destructive side, Mars is anger, aggression, accidents, pain and violence. On the constructive side, Mars is motivation, assertion, passion, lust, courage and dominance. Whichever sign and house Mars is placed in your chart, will give you an indication of the style and direction in which you use the warrior energy. In the world, Mars represents masculinity and youth, but also males in general, like your male friends and brothers. It’s an indication of many things, but for example, it also represents: blood, muscles, weapons, fire, cars, sports, the military, exercise, and penetration. 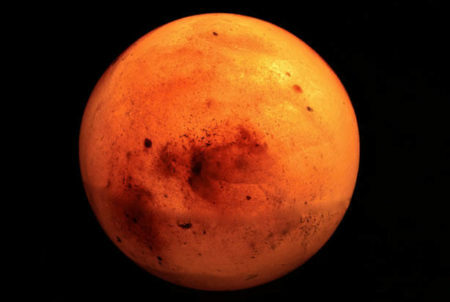 The symbol of Mars is a circle with an arrow protruding upwards from it. This symbolizes the male organ and function, depictive of masculinity, movement and drive. It is an invasive and destructive energy, but it also gives us the courage to destroy what is allowing for weakness in our lives in order to forge a new pathway through the forest of our habits, that will ultimately bring success from the determination and focus it takes to create something stronger. Wherever Mars is situated in our chart, indicates where you will exert the most energy in life. Mars rules the signs of Aries and Scorpio, and is exalted in Capricorn, which is the sign of the general. This combination produces a capable, military strategist energy that is skilled with weapons to defeat the enemy… whatever that represents in our lives.